A user can use the Print dialog box to select a printer, configure it, and perform a print job. Print dialog boxes provide an easy way to implement Print and Print Setup dialog boxes in a manner consistent with Windows standards. The Print dialog box includes a Print Range group of radio buttons that indicate whether the user wants to print all pages , a range of pages, or only the selected text. 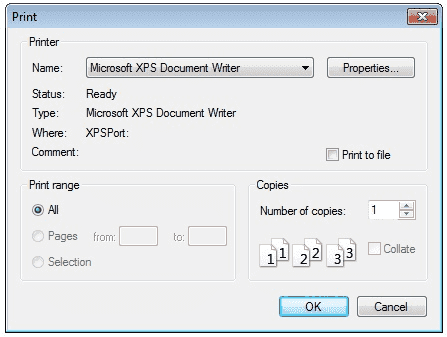 The dialog box includes an edit control in which the user can type the number of copies to print . By default, the Print dialog box initially displays information about the current default printer. How to print a Document in C#? PrintDocument object represents a document to be printed. It encapsulates all the information needed to print a page. They associate with the control which content can be print. They handle the events and operations of printing. Once a PrintDocument is created, we can set the Document property of PrintDialog as this document. After that we can also set other properties. With the help of PrintPreviewDialog You can preview a document also.